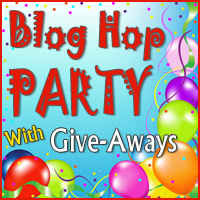 Quilty Habit: Blog Hop Party Giveaway! "Rudolph" is a favorite this year - my son is just learning the words! Cute giveaway!! I love all Christmas songs but my all time favorite has to be Snoopy Vs. the Red Baron. My favorite holiday song is "2 step around the Xmas tree!" It doesn't come on very often, but when it does, I always get excited! My favorite Christmas son is "All I want for Christmas is You." My favourite Christmas song is "Mary Did You Know?" My favorite Christmas song is I'll Be Home For Christmas. On another note, I really like the lanyard I bought from you!! I could definitely use another for my scissors. Thanks for the opportunity to enter your great giveaway! Thanks, Jess, for the chance to win your giveaway. My favorite holiday song is Jingle Bells because I just love to hear my 4-year old son sing it. Happy holidays! Little Drummer Boy is an all time favorite of mine! Thanks! I would love this lanyard - sure would turn some heads at work!!! My favourite is O Holy Night. But hearing my young grandson singing Jingle Bells Rock has almost changed my mind. Great lanyard...I could use it at work, and look fashionable despite my scrubs! My favorite holiday song is "God Rest Ye Merry Gentlemen" by Sarah McLachlan and the Bare Naked Ladies. It rocks! Always cheers me up and gets me in a holiday mood! My favorite son is I'll Be Home For Christmas! Joy to the World! I sure could use the lanyard and one that is so cool! Cool Lanyard! I used to have to wear a ID/permit card all day. We laughed & claimed we wouldn't know who we were without them! Favorite? Angels we have heard on high! I am a new follower, and my favorite song is "Mary did you know? Thanks for the giveaway chance. Very pretty! My traditional love is I Heard the Bells on Christmas Day, but I am also liking many others this year. Thanks for a chance to win. My favourite Christmas song is Jingle Bells :) Barb. That is a beautiful lanyard, and you are very generous to give it away. My favorite holiday song is "Jingle Bell Rock" -- i sing it to myself all year long and it always makes me happy. Cute lanyard! My favourite song is Silver Bells, I like the visual I get from it. My favorite song is "Mary Did You Know" by Kathy Mattea. Thanks for the chance to win. too cute to pass up a chance to win this. thanks for the chance. My favourite Christmas song is A Huron Carol. my favorite holiday song is "it's beginning to look a lot like Christmas!" Ooh, pretty! My favorite is Carol of the Bells. I am enjoying listening to Ring the Bells this year. Thanks for being in the giveaways. I am a new follower. My favorite Christmas song is "What Child is This" thanks for the chance to win. My non-Christian song is: I want a hippopotamus for Christmas. My favorite Christian Christmas song is Go tell it on the Mountain. Silent Night is my favorite, your lanyard would be perfect for a camera, great giveaway! Silent Night is still my favorite! Love the lanyard. My favorite holiday song is It's Christmas Time Again, by Tom Petty. Love that song. Lovely...My favorite Christmas song is "All I want for Christmas is You"
Lovely giveaway missy! Oh this is hard to think of because I'm on in on the holiday spirit yet. I do love the Amy Grant Home for the Holidays album. That does get me into Christmas. My favorite holiday song is White Christmas. I'm quite traditional and love carols. In the Bleak Midwinter is my favourite. My favorite is "Little Drummer Boy". My favorite song is "I'll be home for Christmas"
Lately I have been into anything that is just instrumental. However the one that always gets me is "Mary did you know?" Makes me cry every time! My favorite holiday song is still White Christmas by Bing Crosby. Love it! Thanks for sharing! I love Jingle Bells played by my sons' tuba Christmas group, they put an extra bit in the middle and it makes it something special. Thanks for the giveaway. I was just telling my bf yesterday how I need a new lanyard since mine is ugly and gross looking (dropped it in a mucky rain puddle in September), this one would be great! my favorite holiday tune is Greensleeves. thanks for the giveaway! I love the lanyard! I know I'm going to butcher the name, but my husband has really gotten me to love Melekimeke Maka (?) Thank you for the great giveaway! Maria durch ein Dornwald ging, is still my favourite and has been for years.. thanks for the chance! I am a sucker for Elvis's "Blue Christmas". Lovely Lanyard! I love the song, Breath of Heaven. My favorite song is Mary did you know? thanks for the giveaway this would be amazing to use at work. so much more stylish than my current neon blue one! I love "Silent Night, Holy Night" Thank you for this giveaway. Fun giveaway - thanks for the chance! I love Holly Jolly Christmas...it's such a happy song, perfect for getting into the holiday spirit! My favorite holiday song is O Holy Night. This year the kids have a toy that plays Away in a Manger at light speed and it is drilled into my head . . .
My favorite song is Oh Holy night. Fat chance though, it's a balmy 70 today. We three kings is a favorite of mine. I like that each verse is a discription of the gifts the kings bring. Any song sung by Josh Groban. But my favorite Holiday song is "Oh Holy Night'. I love the lanyard. It would definitely help me out with not losing my keys. Deck the Halls. It's lively and fun to sing while quilting. Thanks for the giveaway. Hi, Happy Holiday to you and yours, I have to say White Christmas. Thanks for your giveaway. Love this,thanks for chance to win it.My favorites are Silent night and Jingle bells. I love Silent Night. Thanks for the giveaway. My favorite song is Joy to the World. Thanks for the giveaway. Silent Nigh is my favorite Christmas song. Favorite song - at the moment I like Merry Christmas Baby! Stash Away, Stash Away, Stash Away ALL! I enjoy any song sung by Bing Crosby...his version of White Christmas is my favorite! I love most all Christmas songs but I love "Mary, Did You Know"...and also "Grown-Up Christmas List". Very nice lanyard. I lived in NJ for over 50 years and now am retired in southern Delaware. Good luck on your upcoming marriage! I love all Christmas music and it would be hard to pick one. Your landyard is very nice and I would wear it to my volunteer job. Down in Yon Forest, sung by Joan Baez. You can listen to it on YouTube. Your lanyards are cool and I love that ITB Yenter fabric. Thanks for joining the giveaways. I love "Mary, Did You Know." The words are so meaningful. Great lanyard -would love to give it to my daughter who uses one every day! O Holy Night is my fave. I love Josh Grobin's version of O Holy Night. Frank Sinatra's Silent Night. Thanks for the generous giveaway and a chance to win! I love O Holy Night. I would give this to my sister ! She's about to graduate from nursing school and would love it for her hospital ID. One of my favs is Silent Night! Merry Christmas and thanks for a great giveaway!